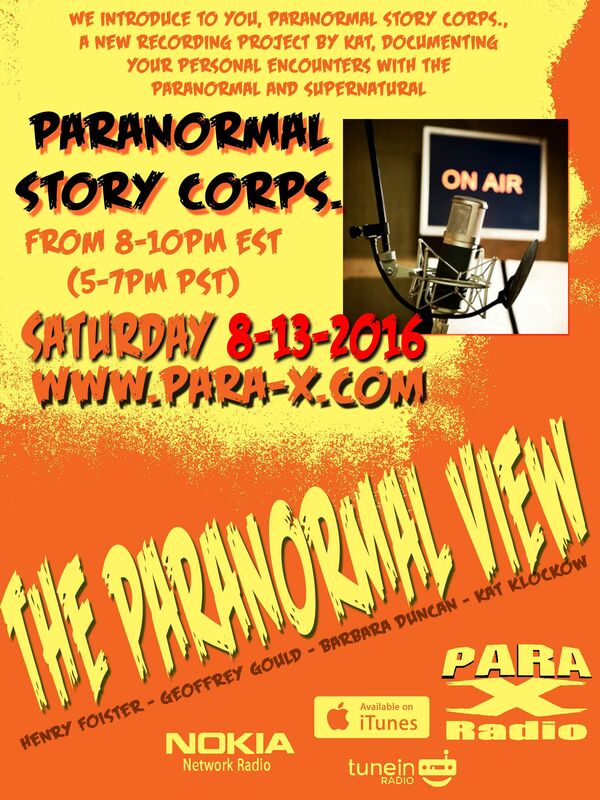 13 August 2016 "The Paranormal View"
Moments into the show, Henry got a phone call, inadvertantly having not yet silenced his phone for the show. Kat joked about how Henry consistently receives phone calls, always from Walmart, when they were off on Gettysburg investigations. Henry asked Ceiling Cat Barbara Duncan about her trip to Alcatraz, but her tour was long before they started night time tours. Henry spoke about Whispers Estate is doing their group investigative tours: $400 for ten people. With Kat having moved to Providence, she laments no longer being able to visit the Columbus Ohio Hannah House as much as she'd like, the location of which was disussed at length. Henry mentioned Poasttown Elementary School having an upcoming Meet & Greet, albeit not on their site's scheduled events listing: only their August 16th 2016 open investigation night being the only at-the-time upcoming event on their events page. Kat has created what she calls The Paranormal Story Corp, similar to StoryCorps on NPR type radio. With Kat's Paranormal Story Corp, it's about Paranormal Experiences. At Ocean State Paracon, Kat was able to get several interviews. She played three stories of the eight, as five got lost when her computer began acting up and lost the files. First up was nine'ish year old Dorian's story, walking up his home stairs, and hearing "Good Night" invisibly whispered into his ear. We discussed at length the fascinating Kinect ghost videos, a few of which I've posted on the show's Facebook page such as this one, specifically the stick figure aspect aka skeletal view. This led to a fun "spirited" debate, if you will, where Kat and I played devils' advocates, endevouring to explain that the Kinect camera appears to recognize perhaps the manifesting energy patterns, as opposed to physical matter. We then played a story Kat was provided by Eric Martin of the Northeast Paranormal Research Society discussing about a negative entity they encounted during a residence investigation. After the second break CC reported tonight our having listeners in the US, the UK, and Canada. We offered people in the live chat room to provide their paranormal stories; previous guest Tina Marie Ronan who regaled her story. After the third recorded story was played, regarding a Masonic Lodge investigation, Kat indicated about Odd Fellows halls. Kat has visited one Odd Fellows place in Converse, Indiana, which was very creepy. Henry conveyed that the next week we would have cryptid investigators Brian and Terry Seech of the Center for Cryptozoological Studies, and that later in the month author Marie D. Jones would be returning. Kat announced she and Henry would be back investigating Gettysburg April 21-23 2017. Henry indicated staying at the Battlefield B&B, while Kat wants to stay back at the animal-friendly David Stewart Farm for that.